Hosts for the recent 2017 ITTF Pan American Cup; Costa Rica responded to the challenge; now at the 2017 El Salvador Junior and Cadet Open, their young players have responded in the playing arena. Represented by Ricardo Azofeifa and Alfredo Sanchez; Costa Rica ‘A’ reserved their place in the main draw of the Cadet Boys’ Team event, as did the partnership formed by Juan Trejos and Bryan Solis on duty for Costa Rica ‘B’; not to be outdone the Costa Rica ‘C’ Team pairing of John Lopez and José Perez followed suit. Ricardo Azofeifa and Alfredo Sanchez completed their first phase group fixtures in second place behind the Puerto Rico ‘B’ Team pairing of Angel Naranjo and Jabdiel Torres. Similarly it was second spot for Juan Trejos and Bryan Solis; they finished next in line to the El Salvador ‘A’ Team duo of Enzo Leiva and Mateo Martinez. It was for Juan Trejos and Bryan Solis, a second place hard earned; in the engagement that decided runners up spot, they were extended the full five match distance by the Sweden ‘C’ Team duo formed by Kevin Brunzell and Elias Sjörgen. Backbone of the victory was Bryan Solis; he accounted for Kevin Brunzell (11-2, 11-4, 13-11) and Elias Sjörgen (11-7, 11-9, 11-9). Second places for two outfits from Costa Rica; for third duo it was top spot. John Lopez and José Perez remained unbeaten to finish in first place in their group ahead of the Belize pairing of Devesh Hukmani and Taye Parkinson. Certainly it does the heart good to see developing associations in the guise of Belize and Costa Rica now reaping rewards for dedication and hard work. Meanwhile, in the remaining three groups, it was first place for the Puerto Rico `A’ Team of Gustavo Cruz and Daniel Hernandez, as it was for the Guatemala ‘A’ Team combination of Sergio Carillo and Jorge Chacon. Likewise, the Sweden ‘A’ pairing of Linus Keraenen and Teodor Sileholm, also reserved top spot in their group. Respective runners up positions and thus passports to the main draw were gained by the Guatemala ‘A’ Team duo of Luis Fernando Ton and Luis Ton, in addition to Sweden’s Love Iwarsson and Tom Holmqvist. They secured second places alongside the combination formed by Chile’s Cristian Carillo who partnered Guatemala’s Julian Ruiz. 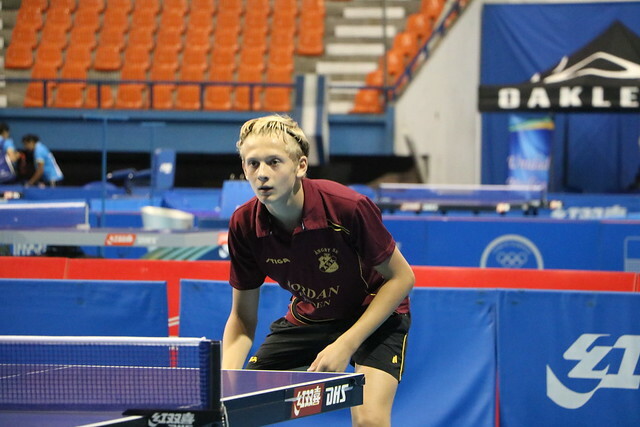 Teams finishing in first and second positions in each of the three groups advance to the main draw; the Cadet Boys’ Team event concludes on Thursday 17th August.